Three California State University, Stanislaus students will be awarded Warrior Book Collection Contest cash prizes on Friday for eloquent reports on their favorite series of books. C. Anne Engert, an English major from Oakdale, will claim the $300 first place prize for her report on what she describes as the "New Me" collection. Second place prize of $200 goes to English major Maria K. Gasaway of Atwater for her paper on her Swiss Family Robinson collection and History major Abby Peretz of Merced will receive the $100 third place award for an essay about her fantasy literature collection. The University Library will present the winners with their awards at 11 a.m. on Friday, May 9 in the second floor foyer of the Vasche Library Building. Carolyn Stefanco, Dean of the College of Humanities & Social Sciences, will make the presentations. 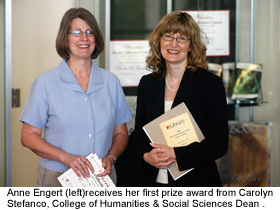 Engert said her collection served as a catalyst that helped transform her life. Following a break from her religious tradition, she delved into once forbidden works that explored psychology, mind control, loyalty, disclosure, and various worldviews. Her readings also included an exploration of fictional works detailing the structures of highly controlled, oppressive cultures. Engert said the books embody a search for self-knowledge, each shedding light on "some corner of the human experience that I needed to see when I reached a terrible and thrilling crossroads in my life." Gasaway said the Swiss Family Robinson adventures capture her imagination and curiosity with each change discovered in a particular version. Describing her love of books, Gasaway recalled the exhilaration that she felt when, as a third-grader, she was told that she could check out anything she wanted from the library and enjoying the "tickle-your-nose smell of a real library book." Peretz noted that her collection of fantasy literature began as a medium for distancing herself from what she described as the restrictive values of her parents. It has since become a bridge that provides a new connection between her and her own child, she pointed out in her essay. "As she begins to conquer my collection I hope, above all else, that she will pick up the messages hidden within the lines of so many of these books: doing what is right is not always easy, heroes can be found in the most unlikely places, and even grown-ups can imagine," Peretz said in her essay.